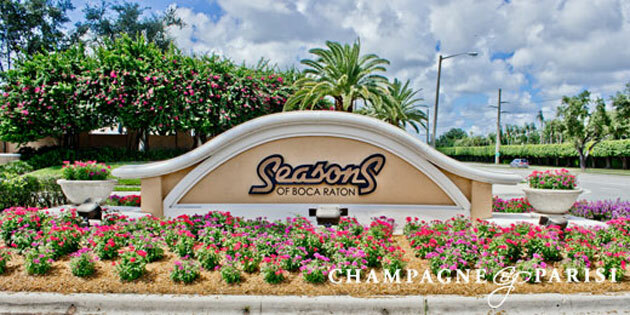 Seasons is an exclusive, upscale gated community located in the heart of Boca Raton. This family friendly neighborhood boasts meticulously manicured landscape, oversized lakes, and stately South Florida trees. As are a number of beautiful, extravagant communities, Seasons is perfectly located along the famous "Millionaire Mile," on the corner of Jog and Clint Moore Road. Developed in the early 1990's, Seasons is comprised of 255 single family homes. These exquisite homes feature a variety of Tuscan and modern architecture, thereby making each home unique and with its own feel. In this gorgeous development, there are multiple layouts to choose from, with 3 bedroom open floor plans to 6 bedroom courtyard homes available for your choosing. Homes in Seasons range in size from 3,000 square feet to nearly 7,000 square feet. Homes for sale in Seasons range in price from $600,000 to just over $1 million. Residents in Seasons enjoy many resort style amenities. These include but are not limited to a newly-renovated clubhouse, state of the art fitness center, a heated resort-style swimming pool, and a hot tub, as well as a children's pool playground, 8 lighted clay tennis courts, a tennis pro shop, basketball court, and volleyball areas. Evidently, living in Seasons offers residents a lifestyle filled with luxury and sophistication, while at the same time being nestled in a warm, intimate community.